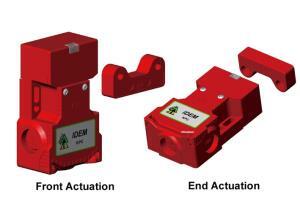 All of IDEM’s Coded Non-Contact Safety Switches are designed to conform to IEC60947-5-3 and be used as directed by ISO12100, ISO14121 and EN60204-1. They have a coded magnetic sensing which provides a wide sensing distance and provides a high tolerance to misalignment after sensing. 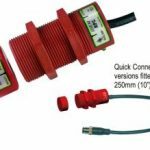 They can be fitted behind stainless steel fittings and can operate from 4 directions even in extreme environments of temperature and moisture. When used in combination with most dual channel safety monitoring relays they can be used to provide up to PLe Category 4 to ISO13849-1. The Plastic IDECODE range has been developed for non-contact guard door interlocking in the applications of general factory automation, packaging and some food processing industries. 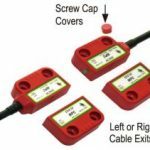 IDEM Coded Non-Contact Safety Switches are designed to interlock hinged, sliding or lift off guard doors. They are especially advantageous in the following situations: When poor guard alignment exists; anti-tamper sensing is required; high hygiene requirements exist, e.g. food industry hose down; where long life is required (no moving or touching parts) or where LED status indication is desirable.